And also because out-of-town guests are always a little scared when you take them to a bodega for breakfast and swear they won’t get food poisoning. Donna Bell’s Bake Shop on 49th near Eighth Ave. is an unexpected treat haven in a nothing-special section of midtown I deem… NoTiSqu. Although DB’s is darling, unknowing tourists rarely give it a try because they get sucked in to the familiarity of Starbucks right next door. 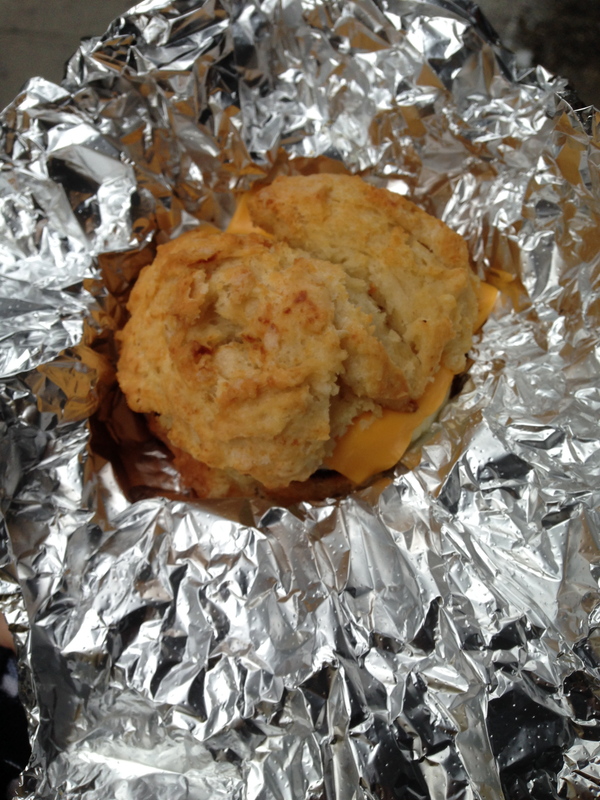 Little do they know that inside DBs lives the most delightful grab-and-go egg breakfast sandwich on a fluffy biscuit (that I have had the willpower to avoid on the way to work for the past four months…until last week). ANYWAY, you can get it with freshly carved ham or roasted turkey or a sausage or veggie patty. They also serve Cafe Du Monde coffee. McDonald’s this is not. 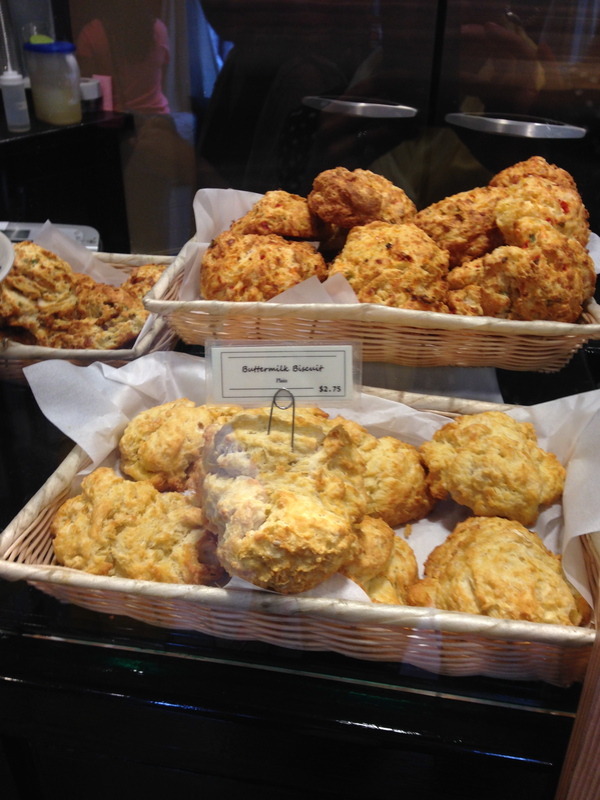 Peer into the storefront and see towers of homemade southern baked goods like scones and muffins alongside the huge buttery biscuits, and also a variety of seriously special sugary bars and squares and cakes and pies. This is where carbs go to die. But first they will make you very, very happy. Fun fact: Donna Bell’s is owned by actress Pauley Perette (NCIS) and her two best friends. Sad fact: Closed on Sundays. 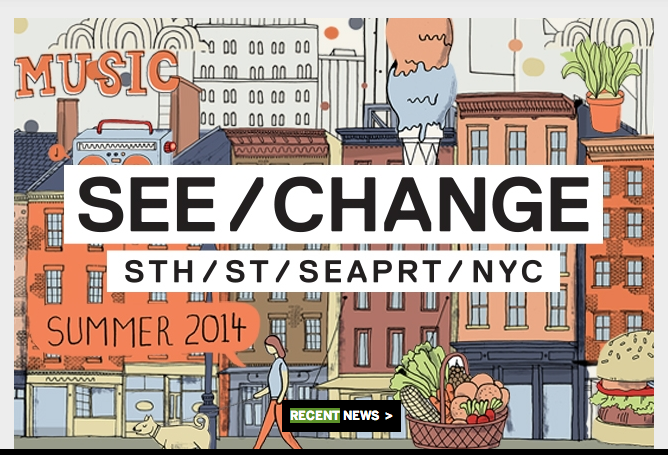 I grabbed this image from the South Street Seaport website. I swear—your next playdate should be at South Street Seaport. On summer Sundays from 2-4pm, the See/Change stage features a kid-friendly program that miraculously (!) does not drive adults nuts. Live music and DJs (playing more than kiddie tunes) add to a mini-scene that is not crowded or lame. The astroturf area is semi-contained, so tots can move around while parents kick back in sling chairs. Plus, there is shade! And it’s free! What’s not free are the $8 sizable draft beers sold by the two-week-old Ambrose Hall, but who cares with DJ BagelBites leading the party? “Family programming” aside, there’s a lot happening down there as the area continues to rebuild after Sandy. Pop-up shows, food trucks, an art gallery, outdoor movies and live entertainment make it a good place to while away an hour or two this summer. I might be getting old, but I like things to be easy. And did I mention the shade? 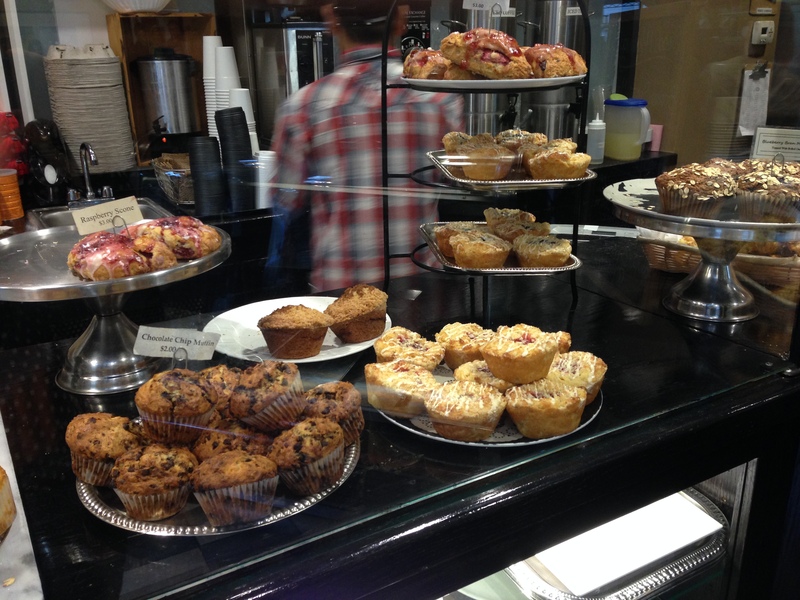 If you haven’t been to Gotham West Market yet, you should swing by. And if I sound like I own the place, it’s because I live upstairs. So yeah, I like to pretend it’s my personal charcuterie/coffee shop/craft beer bar/ramen spot/tapas place/burger joint/artisanal market. Manhattan has a new lobster shack—and it floats. 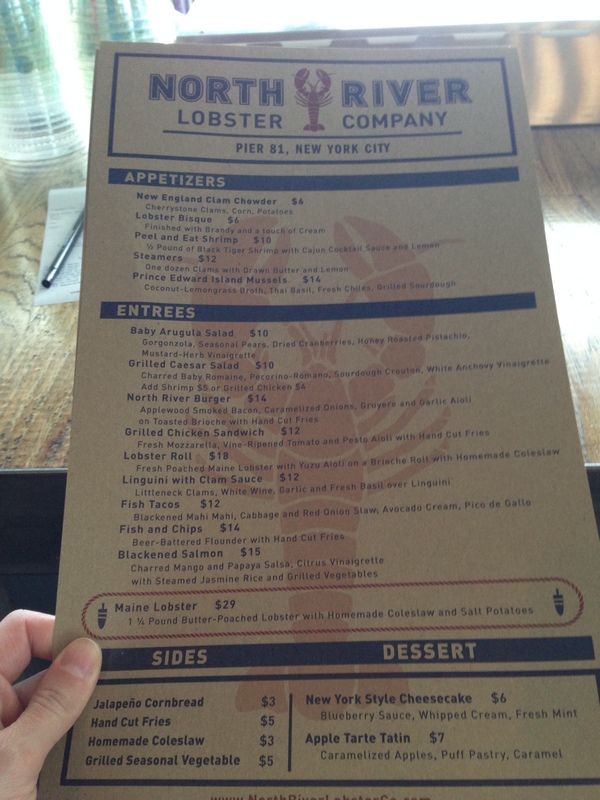 North River Lobster Company opened on Saturday at Pier 81. It’s on a boat (that sometimes sails). Think Frying Pan, but for grown-ups. Grown-ups who want a snack. Along with lobster rolls ($18), clam chowder ($6) and fish and chips ($14), the crew of this multi-level boat serves up whole lobster, fish tacos and some non-finned fare. 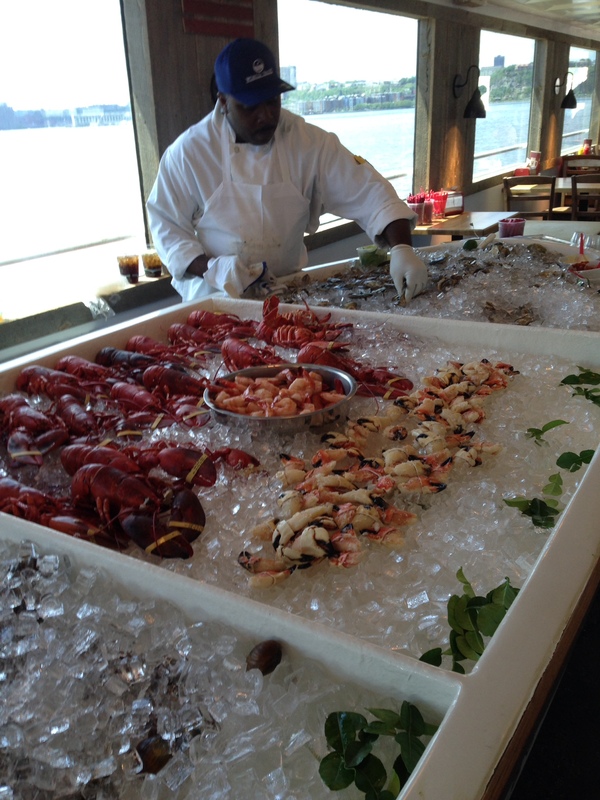 There is also a serious raw bar. And there are two of those other kinds of bars, too, the ones where you can perch on a stool and order a mason jar cocktail or a beer. Or a bucket of beer. While they were still working out a few kinks on opening day, this is a great place to stop if you are meandering down the west side. There is a slight chance that its out-of-the-way location on 42nd and Twelfth might prevent it from being mobbed this summer. But that might be wishful thinking, so you should probably just go now. Before the Frying Pan overflow finds out about it. 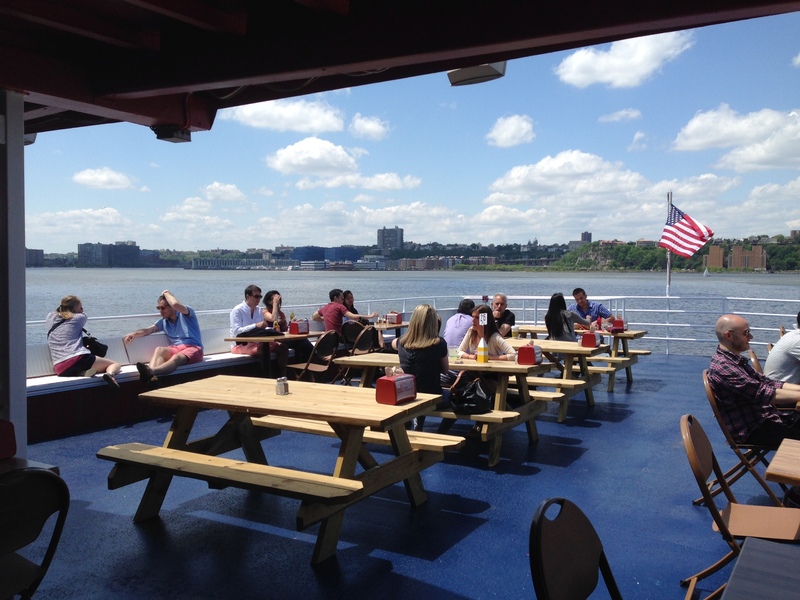 Wouldn’t you like to be eating a lobster roll here instead of sitting at your desk? Walking around the hood today, B and I noticed a new biz cropping up! And it happens to be our fave thing: a restaurant. (Yay! More food.) Apparently, Flat Top is a bistro. Or a cafe. Or a place to drink wine. Or a combination of all three. Sleek-looking with a blue-gray exterior, it caught our attention because it’s so different from anything else in the area. Since we moved here three years ago, the area has seen some great additions: Bettalona, Jin Ramen, Kuro Kuma, Toast Chicken, etc. But this is much pricier than our typical local joints. Who are they hoping to attract? Students on scholarships? Independently wealthy professors? The Harlem elite? Maybe just curious moms with blogs. I REALLY love wine tasting on the North Fork. I’ve experienced it by bike, in the dead of winter, in a chauffeur-driven car and even with a baby. Done responsibly, it’s an easy and relaxing day trip from the city. (Just time it well, traffic-wise.) On my most recent visit, we explored two wineries that didn’t exist the last time I was out there. But I was so impressed with them! 1. Sparkling Pointe: With the motto “If it’s not sparkling…what’s the pointe?” this place is obviously all about the bubbly. It’s the only NY winery dedicated to the exclusive production of Méthode Champenoise (which basically means the French method). While it’s one of the more expensive tastings on the North Fork ($17 for a flight of four wines), your palate will thank your wallet. The space itself is beautiful: light, airy and modern, with white walls and brightly colored paintings depicting scenes of … life in Brazil? Yeah, just because the owners love it there. (Their Carnaval costume is at the entrance to the gift shop). While this is a little bizarre for Southold, it’s a nice touch that helps further distinguish Sparkling Pointe from all of the other wineries. Same with the huge back patio, where cool-looking people in sunglasses enjoy bottles on ice, creating a bit of a Miami-among-the-vines feel. 2. One Woman: First of all, just look at this adorable place! 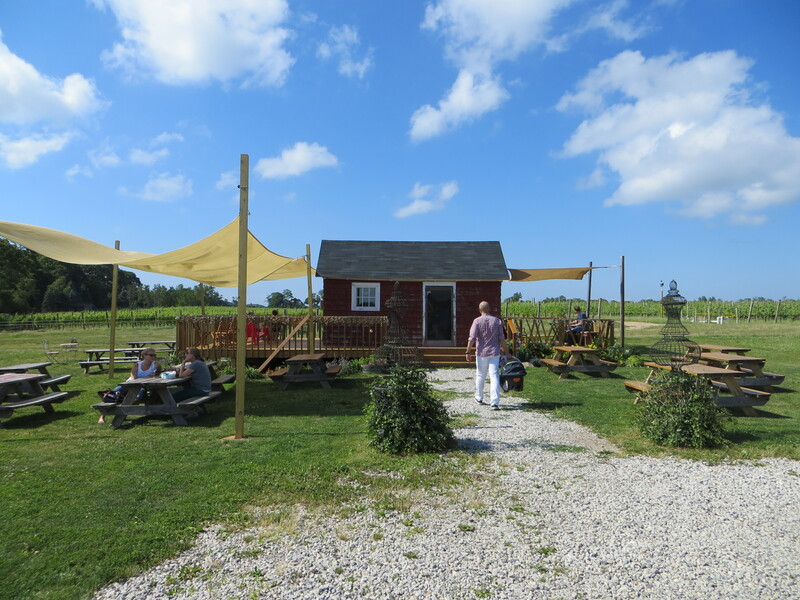 A tiny hut serves as the tasting room for an awesome one-woman show. Claudia Purita grew up in Italy tending to her family’s farm; now she singlehandedly cares for her own grapes. When we visited, her daughter was pouring in the tasting room and said Claudia hardly ever comes in—that’s how much she prefers to be out in the field. 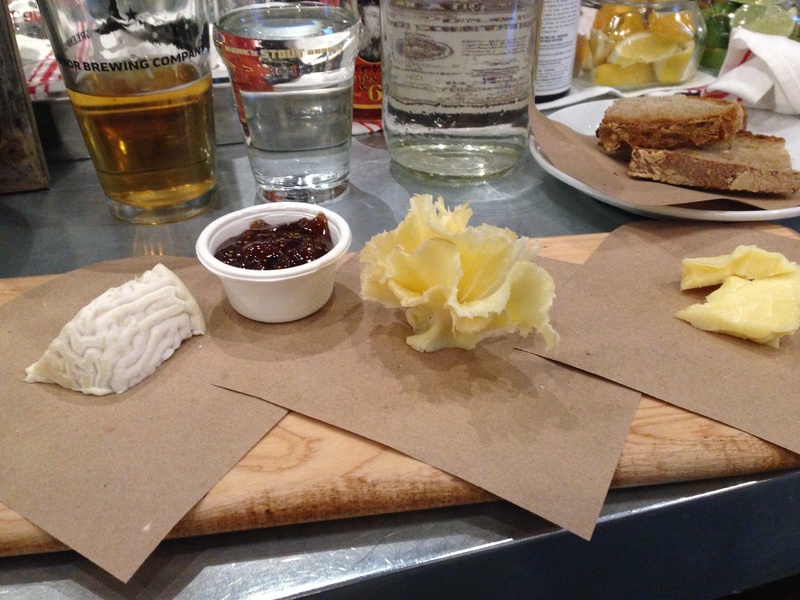 By the way, these “tastings”? They are serious pours (unlike the precisely measured ounces from the nearby factory-feeling Pindar, for example). There were only a handful of people at One Woman, so we enjoyed our sauvignon blanc buzz on the teeny porch at a totally unpretentious picnic table. Sometimes it feels good to get out of Manhattan. 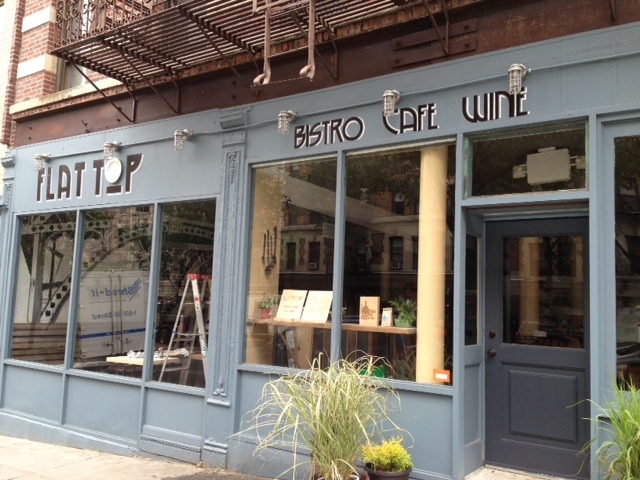 When I heard a new resto-bar was opening around the corner, I did a little dance. When I saw it was a chicken concept, I had a little cry. Then I actually tried it. Anyone who knows Columbia knows Toast. There’s one on 105th and Broadway (they call that one “downtown,” which is funny) and another at 125th and Broadway. Most people would say two is plenty. 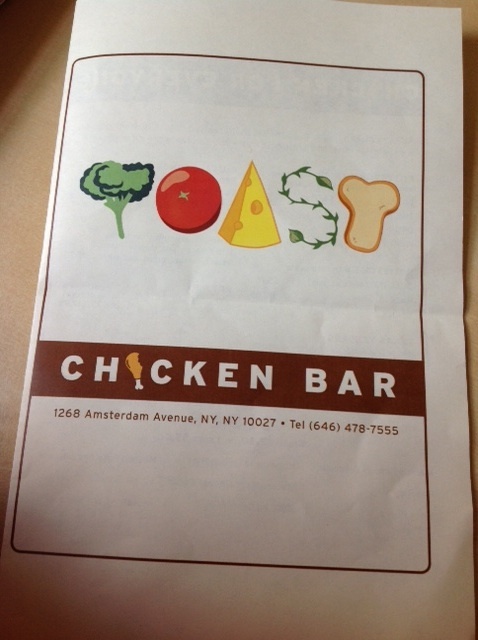 While the new Toast Chicken Bar (ew?) on Amsterdam has the same odd, brightly painted walls, a similar large bar area pouring good drafts (Dales, Victory, Southern Tier, Ommegang), its menu is totally different from the everything-offered list at the other two outposts. Honestly, I don’t love chicken. But my meal here was good. The birds are raised naturally, free roaming and veg-fed; choose from buttermilk fried, rotisserie, tenders, a wrap, even a pot pie. Apps include avocado fries and deviled eggs and sides are the usual mashed potatoes, mac-and-cheese gratin, broccoli, etc. I’m not gonna lie: I was skeptical of the wannabe Southern factor, especially because this part of town doesn’t take its Southern food lightly. But Toast Chicken executes well. (There are a few salads, but it’s better if you like fried things.) Texas tenders were light and crunchy, not oily/greasy/nasty. The roasted chicken in our wrap was moist and flavorful (although apparently the herb pesto that comes with the plain version is to die for). And the prices are ridic: a giant, shareable wrap, three (HUGE) tenders and two sides came to a total of $22. Next time I’ll try one of the beer cocktails (from $6), like the Hound (Hefeweizen and grapefruit juice), Cherry Diesel (Boylans cola, cherry juice and lager), Black Shandy (stout and sparkling lemonade), Beery Mary or Michelada. The Boylans, BTW, is on tap. Apparently we screwed up in not ordering the donuts for dessert. Thing is, I had my fill of donuts when the trend peaked five years ago. Come to think of it, that’s also when the chicken trend reached its loudest cluck. Oh well, uptown blooms late. But we still like choices–even if they are of the chicken variety.